Not a good night for anyone. CBS: The ACADEMY OF COUNTRY MUSIC AWARDS fell half a point from last year’s ceremony to a new low 1.6. The night started with 60 MINUTES down 1.1 from last week’s basketball-boosted mark to 0.9. ABC: Hurt by the music competition at CBS, AMERICAN IDOL fell 0.2 to a new series low 1.0. SHARK TANK returned from a week off down 0.1 to 0.8. The night began with AMERICA’S FUNNIEST HOME VIDEOS down 0.1 to 0.8. 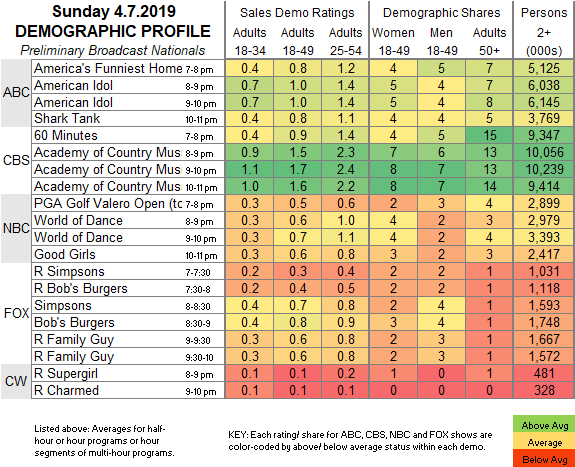 NBC: After a golf overrun, WORLD OF DANCE (0.7) and GOOD GIRLS (0.6) were steady. FOX: The only new shows of the night were THE SIMPSONS, down 0.1 to 0.7, and BOB’S BURGERS, down 0.1 to 0.8. The reruns around them were at 0.3-0.6. Tonight, CBS airs the NCAA TOURNAMENT CHAMPIONSHIP GAME.